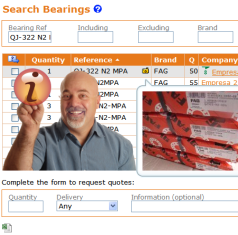 Join BS now and check how easy is to buy and sell bearings Join us now! In BearingStocks THERE ARE NO FEES. You can upload your stock and work (buy & sell) without paying any fee. If you want to see all Inquiries (and Demands) without limitations, choose the option: "Unlimited Inquiries for 1 year”. In My Stock you can click on "Make an Offer now" button to make the selected reference appear first in the search results during next 30 days. During the promotion of Offer section, each company can make 10 Offers per month (up to 30 if Premium) To add more Offers, you can buy credits. Each Offer costs one credit. In addition, Offers are shown in their specific section "Offers". If you include a price in the Offer, it will also sent to other distributors by Twitter . In My Stock on the top you can choose the day and time during which any reference from your stock will appear first in searches results. The cost depends on the day and time chosen and the number of lines of your inventory (varies with the number of queries received per hour). If you change your mind, the chosen hour can be canceled up to 12 hours before. You can include in Offers menu lots of bearings. Send your surplus lots to support@bearingstocks.com, indicating quantities, references, brands, prices (recommended) and any additional interesting information. In "My Data - My Profile" option menu you can indicate the countries where your company DOES NOT SELL. This will avoid receiving Inquiries that you’re not interested in. If you prefer to indicate the list of countries where your company SELLS (i.e. if you only sell to your country), you can use the option "Show allowed countries" and add to the list the countries where your company SELLS. You would be able to share related documents and private messages: the order, the invoice, the tracking number, etc. You would have the historic of your operations so at any time you can view the orders made, the purchase price, etc.